There is always a little bit of question of how things will turn out when a band attempts to follow up a pretty great debut album (2005's Black Mountain). 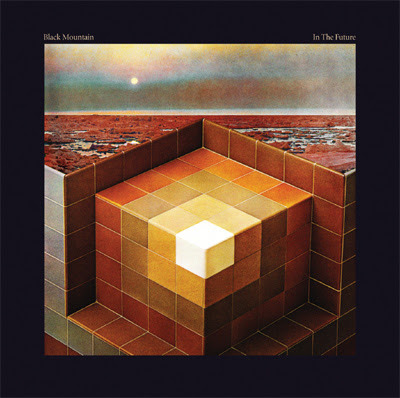 Vancouver's Black Mountain decided to release a sprawling rock (near) masterpiece with In The Future. There is always going to be the lingering Led Zeppelin and Black Sabbath comparisons. The third and possibly best track on the album, the 8-minute epic 'Tyrants', begins with a chugging Sabbath-esque riff that after a minute settles down into something that sounds like it could have been on Houses of the Holy. Amber Webber's vocals with the keyboards halfway through the song are absolutely haunting before the guitars thunder back towards the end. 'Tyrants' final moments are the sweet duet of Webber and Stephen MacBean and encapsulates everything great about this band. The addition of keyboards on this record really stand out, especially on tracks like like 'Tyrants' and 'Wucan'. Even a track like 'Stay Free', which is almost pretty at times, can sound dark with McBean's lyrics. Unlike thier first album, In The Future doesn't really have any lulls or any places that let you come up for air. They have proven themselves to not only be a pretty great band, but show signs that there is much more to come.